The Diamond Mesh fencing is strong, safe and flexible, it does not rust or break, nor sag or roll up at the bottom. It features close 2 wires on 4 inch spacing from the ground to the top to help keep predators out. It features class III galvanization. 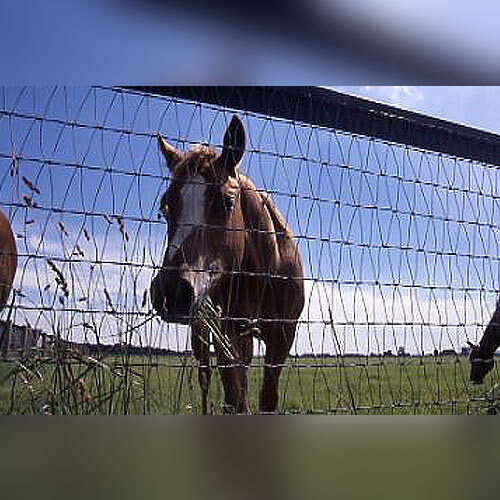 The RAMM Diamond Mesh fence is the safest and best priced of the different types of horse fences. 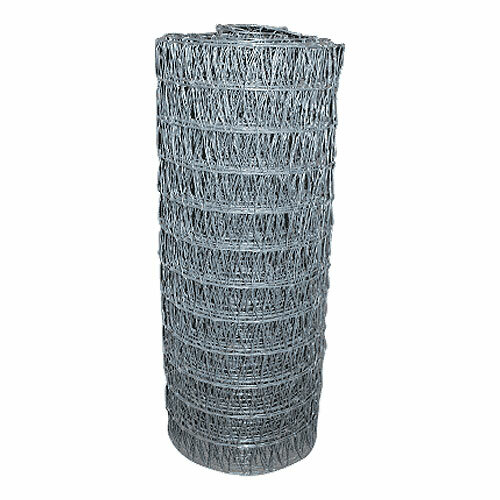 This wire mesh fencing is strong, safe and flexible, it does not rust or break, nor sag or roll up at the bottom. It features close 2 wires on 4 inch spacing from the ground to the top to help keep predators out, and its knot construction prevents horses’ hooves from becoming caught in this fence. - This is exactly the type of fence I need to help keep coyotes out and my little foals in. The shape of the diamonds are the only thing that keeps the foals from pushing their hooves through. Looks great with the top rail of Flex too. Thanks. - I love the Diamond Mesh Fence! It looks amazing with the high impact flex rail on top! The fence is strong and super safe fence for horses and sheep. The fence was not difficult to install, but it is heavy to handle, unroll and stand up, it is also a job to splice rolls together correctly. But I took my time and you can't even see the splice! LOVE this fence! Ramm customer support was fantastic, they answered my questions and made sure I had everything I needed for a smooth fence install project. Material: Made from 12.5 and 14 gauge galvanized wire. Installation: RAMM Diamond Mesh installs quickly and easily with 1.5" or 2" barbed staples into wood posts. *Staples are sold separately. Note: RAMM Diamond Mesh fencing isn’t as visible as most fences, so adding a top rail of RAMM Flex Fence® to improve strength and visibility is suggested.